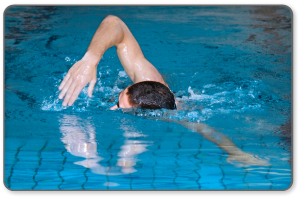 Shoulder impingement syndrome is also known as swimmer's shoulder and thrower's shoulder and is caused by inflammation in the subacromial space - a narrow, bony area where tendons and muscles of the shoulder pass through. You have sharp pain when you use your arm overhead. You have difficulties reaching up behind your back or elevating your arm. You feel weakness in the muscles in your shoulder. If you are experiencing any of those symptoms or you're suffering from on-going pain on the in your shoulder then you might have a shoulder impingement syndrome. If you have been suffering from these symptoms for a long of time, you may have inflammation of the rotator cuff tendons (tendinitis) and bursa (bursitis). Many people don't realize that a shoulder impingement is an injury that can become dangerously chronic, affecting the quality of your life for years to come. 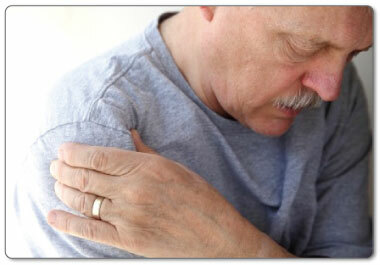 This form of shoulder injury can happen to anyone and can be caused in many ways. An impingement can start from something small such as a repetitive activity as part of your job (ie. painting, lifting, swimming, tennis or other overhead sports) and slowly start to take over your life. 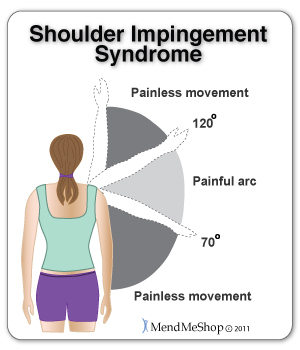 Shoulder impingement syndrome is persistent shoulder pain that affects everyday activities. The space in the shoulder where the rotator cuff tendons, muscles and bursa passes through is very narrow and is known as the subacromial space. This space is made even smaller when you raise your arm. You may notice that you often have weakness when you raise your arm, caused by muscle tendon 'catching' in your shoulder. The pain may be much like a pinch in the shoulder. The tendons or bursa are pinched by the bones of the shoulder and over time can lead to inflammation and degeneration of these sames tendons or muscles. Shoulder impingement syndrome occurs when soft tissue in the subacromial space (considered the 'roof' of the shoulder blade) is pinched. The subacromial space is an area in the shoulder that's approximately 1/2 an inch wide between the humerus (upper arm bone) and the acromion (a bony projection of the scapula). As you raise your arm, the greater tubercle (head of the humerus) moves up towards the acromion process and the amount of space in the subacromial space is naturally reduced. When the shoulder is healthy and everything is functioning properly this narrowed space is not a problem. The supraspinatus tendon and the subacromial bursa lie within the subacromial space. Therefore, these tissues are at the greatest risk of being pinched between the humerus and acromion process when you lift your arm. If the soft tissue in the subacromial space is swollen or the acromion is abnormally shaped, pinching or rubbing of the supraspinatus tendon may occur and/or it can cause a lot of irritation in the subacromial bursa. This pinching of the supraspinatus tendon or subacromial bursa causes the pain of shoulder impingement syndrome, which becomes worse as inflammation increases. Abnormal narrowing of the subacromial space can happen as a result of bone spurs, thickening or calcification of the coracoacromial ligament, a curved or hooked acromion, a misaligned glenohumeral joint, or osteoarthritis spurs on the acromioclavicular joint. Alternatively, if the soft tissue within the space is larger than normal the space becomes even more narrow. 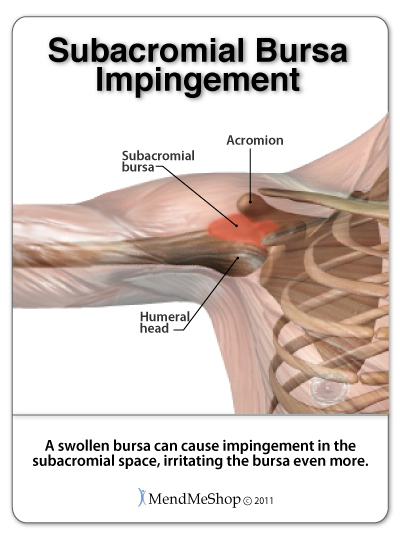 This can occur with subacromial bursitis, or swelling or thickening of the supraspinatus tendon. This condition is also referred to as swimmer's shoulder, pitcher's shoulder, painful arc syndrome, supraspinatus syndrome, and thrower's shoulder. Because it can mimic the symptoms of a rotator cuff tear, tendonitis, tenosynovitis, bursitis or other shoulder problems, it is wise to see a doctor to determine the cause of your shoulder pain. This type of injury can be caused by activities where you need to raise your arms above your shoulder (or head) such as; tennis, swimming, carpentry work, painting. lifting and football or other overhead sports. You may not be able to recall any specific event, injury or activity that would cause such an impingement. Due to the narrow spaces within which your tendons and muscles operate (constrained by the acromion and humerus) an impingement can even start from a thickening of a tendon or other soft tissue. As the thickened tissue becomes more impinged, the irritation builds and swelling continues, thus worsening the impingement. In such cases, the impingement becomes a downward spiral that continues to increase in pain and forcing you to move your shoulder less and less, decreasing your range of motion. Calcium deposits that build-up within the rotator cuff tendon following an injury to the tendon. Poor posture the involves the shoulder blade and poor muscle control. What are the Symptoms of Shoulder Impingement? If you're suffering from a shoulder impingement you may have on-going pain in your shoulder that increases when you raise your arm, reaching above your head to grab something off a shelf, or trying to scratch an itch on your back. The pain may increase at bedtime and even interrupt your sleeping patterns. You may sometimes feel a grinding or popping sensation when you move your shoulder. Typically, impingement pain will gradually develop in the shoulder over time. Pain usually occurs when reaching behind your back (internal rotation) or when lifting your arm. As you raise your arm, the pain is noticeable between 70° and 120°, but not when your arm is straight up or pointing down. This is because when you begin to raise your arm (abduction) there is no pinching, but during the lift, the top of the humerus moves closer to the acromion, limiting the space. With an external impingement, you with feel pain at the front and/or side of the joint when making a throwing motion. If you experience pain when holding your arm out to the side (abducted) or turning it outward it would indicate you have an internal impingement. There are three distinct stages of shoulder impingement that all have different symptoms. In stage I of a shoulder impingement you will feel a slight ache after repetitive overhead movements. Inflammation will occur within the joint but at this stage it can be treated. Treating the pain and inflammation with cold will help to reduce inflammation and swelling. However, if the impingement is caused by an abnormal bone growth or misaligned joint, the cause may need to be fixed with surgery to avoid the impingement from continuing. Stage II of impingement is when the inflammation has progressed and scar tissue starts to form on the supraspinatus tendon and subacromial bursa. This makes the tissue thicker and more prone to further injury. As the tendon and bursa become thicker and more susceptible to impingement, it becomes difficult to break the cycle. During stage II you will experience more pain when doing overhead activity and possibly while sleeping. It is important to treat the scar tissue and inflammation to prevent more chronic problems and to perform appropriate exercises, that will not pinch the supraspinatus tendon or subacromial bursa, to maintain as much range of motion as possible. Stage III of impingement progresses to the stage where abnormal bone formations cause further complications. The subacromial space can be limited by bone spurs, calcification of the supraspinatus tendon, and even osteophytes (small bone growths) that grow on the acromion and/or head of the humerus. This restricts the space available for the tendon to pass through the subacromial space even more, creating stiffness, lack of mobility in the shoulder, and lots of pain. At stage 4, surgery may be one of the only options in order to remove the bony formation, and return to a normal range of motion and less pain in the shoulder. How Do I Diagnose a Shoulder Impingement? Getting a proper diagnosis from your physician is important so you can treat your condition correctly. Typically, you will undergo a physical exam and during this exam your doctor will probably twist and/or elevate the arm of the affected shoulder to determine when pain occurs. This exam will help find out the problem areas of the shoulder (usually in the rotator cuff area). To discover the specific condition, you may also be required to undergo an x-ray to look at joint and bones. An MRI may also give your doctor better look at the soft tissue in the shoulder. From a physicians perspective, the physical exam, x-ray and a MRI are often needed in order to diagnose a shoulder ailment properly. A test for shoulder impingement syndrome is to reach the affected arm behind you towards your lower back, as if to get something out of your back pocket. If you feel sharp pain with this motion, it is possible you have shoulder impingement syndrome and you should see your doctor. You doctor may refer you to a physical therapist. Many people see great improvements in physical therapy with shoulder related problems and are able to treat the condition with conservative measures such as cold compression, and Deep Tissue Regeneration Therapy. How Do I Treat a Shoulder Impingement Injury? The good news is that most cases of shoulder impingement syndrome will heal with simple home conservative treatments and surgery is often not needed! It is generally understood by doctors and surgeons, that surgery will introduce more scar tissue into the shoulder joint. This added scar tissue will be problematic, requiring physical therapy and conservative treatment options post-surgery. If not dealt with properly, your shoulder injury could end up in worse condition than before the surgery! This is why surgery is only performed as a last resort. If you have shoulder impingement syndrome, rest is highly recommended. Avoid activities that cause pain or may have caused the impingement and begin cold compression treatments as soon as possible. A Cold Compress or Ice Pack to reduce inflammation of the soft tissue injury (as soon as possible). A Deep Tissue Therapeutic Shoulder TShellz Wrap to increase Blood-flow to the injured shoulder (DTR Therapy Therapy). Regardless of what stage you are in - you should be frequently working to get the swelling down in your shoulder and increasing blood flow to the injured tissue. This is done by resting your shoulder, using a Cold Compress or Ice Pack (when inflammation flares up), and using a Shoulder TShellz Wrap at least 2 times per day. A Cold Compress or Ice Pack will reduce swelling and pain, and in turn, will reduce the pressure at the impingement. A Shoulder TShellz Wrap will increase blood circulation in the injury area as the soft tissue absorbs the radiant energy with a heat side-effect. This heat will increase elasticity of soft tissue as well as lightly lengthen it, reducing the risk of further tissue strain. In short, the TShellz Wrap will speed the healing rate, increase your range of motion and reduce your chance of re-injury. These tools are the crux of an effective home treatment for a soft tissue injury.. For a shoulder impingement injury, you need to use the TShellz Wrap to break the re-injury cycle and give yourself a real opportunity at healing your shoulder. The trick to healing your damaged shoulder tendons, bursae and ligaments is getting them to heal with minimal scar tissue - something the Shoulder TShellz Wrap is great at! Without treating the scar tissue on the tendons and bursa in the subacromial space, thickening of the tissue can occur leaving you at risk. However, if you heal your shoulder impingement properly and treat scar tissue build up, you reduce the chance of a recurring impingement or chronic shoulder condition. The Shoulder T•Shellz Wrap® can help treat your impingement so you can get back to a life without pain and risk of further injury. Deep Tissue Regeneration Therapy (via use of the T•Shellz Wrap®) will treat scar tissue and promote blood flow to heal your shoulder faster and more completely. Even if you are getting PT treatments, the effect of these products are cumulative so you can treat your impingement at home multiple times per day when you are not at your PT appointments. This is how you accelerate your impingement recovery - you have to take it seriously and treat yourself at home with our natural shoulder treatments every single day! Click HERE to Go To Our Online Store We take all major credit cards and Paypal. If you have questions, call our office at 1-866-237-9608 (toll free continental US). We are currently offering FREE SHIPPING and a 60 day trial period on all our Wraps. The 1st step for conservative treatment of your shoulder impingement is to reduce the swelling to "open up" the area for more blood flow. Anyone in the health-care business knows that your blood supplies the oxygen and much needed nutrients required to heal shoulder injuries. This is why for years doctors, trainers and other medical professional have recommended RICE (Rest, Ice, Compression, Elevation) to treat the pain and swelling of fresh injuries, chronic pain, and after any re-injury. To decrease inflammation and relieve the pain of shoulder impingement syndrome doctor's recommend cold therapy. Cold therapy will relieve pain and swelling and will reduce, or even eliminate, the need for NSAIDs. Cold Therapy works by interrupting and slowing nerve and cell function in the injured area and reducing swelling that can block blood vessels. This is important because once blood vessels are blocked or damaged, they can no longer carry oxygenated blood through your tendon and tissue cells begin to break-down. Without cold compression therapy cellular break-down and tissue damage continues as the cells do not get the oxygen they need to survive. By limiting the amount of damage done to your supraspinatus tendon, you also limit the amount of healing that needs to occur. This is a very important step to get rid of shoulder impingement faster and with less pain! Cold temperatures not only reduce tissue damage, but since cold numbs the nerves, it also reduces pain! Applying cold to your shoulder is the 1st step in treating your impingement injury. Next, you can begin using the TShellz Wrap to accelerate the healing process. After the inflammation in your shoulder has been reduced, providing extra blood flow, releasing tension in your shoulder, and strengthening the tissue around your shoulder is recommended. The only way to get DTR Therapy is through use of a TShellz Wrap. The TShellz Wrap is the only treatment method that improves blood flow and circulation on a deep tissue level. Other methods of increasing circulation in your tissue (hot water bottles, hot baths, etc) will only ever increase blood flow on a surface / skin level. These methods need a LOT of time to even reach your injury on a deep tissue level. And even if you were to use them this long your skin would heat up to an uncomfortable level and may even burn you. Unfortunately, when you are suffering from a shoulder impingement it can be painful to even lift your shoulder. When you limit movement in your shoulder joint the blood flow is reduced, starving your tissue of the necessary oxygen and nutrients. The trick is to find a way to increase blood flow without causing pain. This is where Deep Tissue Regeneration Therapy (via use of the DTR Therapy) becomes a powerful tool. DTR Therapy compliments your body's natural healing process by promoting blood flow while you give your shoulder the rest it needs. Enhanced blood flow (via DTR Therapy) whisks away dead cells and toxins that have built up from your damaged tendon and bursa. When you stop moving your arm and shoulder due to shoulder pain, your muscles and other tissue can become weaker and dead cells and toxins in the area can cause further tissue deterioration - this can lead to atrophy. By clearing the area of toxins and increasing the amount of oxygen and nutrients to your muscles and other tissue, the risk of atrophy (muscle weakness and/or deterioration) is greatly reduced. Keeping your upper arm, shoulder and rotator cuff tissue as healthy as possible throughout the healing process will allow you to improve shoulder strength again once your pain has gone and your shoulder impingement syndrome is gone. Not only does the TShellz Wrap aid in reducing inflammation and improving healing, it helps to prevent long term complications. Pain, lack of mobility, tendinosis, or a complete rupture in the rotator cuff are some of the more common long term complications that can occur when shoulder impingement syndrome goes untreated. By treating your rotator cuff with our DTR Therapy device, scar tissue becomes softer and the supraspinatus tendon, subacromial bursa, and other tissue becomes stronger and more elastic, reducing the risk of chronic problems in the future. As your body attempts to repair a soft tissue injury, scar tissue builds up at the injury location (ie. supraspinatus tendon). This scar tissue can cause the tendon to thicken, decreasing the area in the subacromial space and increasing the chance of impingement. In addition, scar tissue can also bind the tendons and ligaments together within the joint capsule and surrounding the rotator cuff. The inflexible scar tissue limits the movement of these tendons and ligaments that were once elastic and allowed the shoulder its large range of motion. As a result, movement of the entire joint is limited making it difficult to lift your arm or to reach for objects. If left untreated, the shoulder may 'freeze' (a condition called frozen shoulder or adhesive capsulitis) altogether making movement impossible. At the very least, scar tissue leaves your tendon weaker than a healthy tendon, leaving your rotator cuff at greater risk of further deterioration and possible tearing. Fortunately, the Shoulder TShellz Wrap can treat the shoulder tendons (muscles, ligaments and bursae too!) to soften scar tissue and improve the motion and flexibility of your shoulder. Knowing that the TShellz Wrap is an effective tool for combatting inflammation and scar tissue, you should see that this is really the cherry on top of the sundae. The use of Deep Tissue Regeneration Therapy covers a broad range, spanning from injury onset right until your shoulder is completely healed. We actually have customers that bring out their TShellz Wraps after they have fully healed if they start to feel a twinge... and then they put it away again after a couple applications. It is truly a versatile home treatment tool that will surprise you in its efficacy. When treating any soft tissue injury, an effective therapy will increase blood flow to the injury while the joint is immobile. This increase in blood flow will accelerate the body's own ability to heal itself. The TShellz Wrap is a highly effective blood circulation boost device that is approved by the FDA for use at home. In most cases shoulder impingement syndrome can be treated without resorting to surgery. However, if conservative treatment methods have failed after for 6 full months of treatment, then your physician may opt for arthroscopic or open surgery on your shoulder. Arthroscopic surgery is becoming more and more popular, as it is considered less invasive and post surgery rehabilitation is usually quite a bit faster than rehabilitation for open surgery. There are some cases that will require open surgery as the scope of arthroscopic surgery is limited in comparison to full exposure of the shoulder in open surgery. If you undergo an open surgery for your shoulder impingement, you should anticipate a longer period of time for rehabilitation efforts. Generally speaking, a patient will have more scar tissue from open surgery than a patient that has had arthroscopic surgery; this is part of the reason why arthroscopic shoulder impingement post-surgery rehab is shorter. As with any surgery, the surgeon will weigh the costs versus the benefits of performing surgery on a particular case. Scar tissue is something that cannot be avoided during surgery. During the healing process your body will fill in tears in your shoulder (that may have caused your impingement syndrome) with dense, brittle tissue called "scar tissue". The human body will use scar tissue as a temporary solution and will try to build the scar tissue as fast as possible to heal tears in the soft tissue. Scar tissue can form fast to bring together the edges of a tear, but working fast doesn't mean that the job's done right. When scar tissue forms it doesn't come together as neatly as regular (healthy) tissue would. Scar tissue fibers will lay down over top of your tear in a cluttered, messy and jumbled up way. This is how scar tissue works. The scar tissue that forms in your shoulder will be unorganized and won't line up properly with the healthy tissue surrounding the tears. This scar tissue will also attach to everything in and around your shoulder injury including the surrounding healthy tissue as well. This can result in a long-term fusing together of the soft tissue in your shoulder that stiffens your shoulder reducing your mobility and making your injury even more painful! This is why scar tissue is weak and only a temporary solution to heal your shoulder. Scar tissue is something that needs to be dealt with fast. If you try to get back into your regular daily activities with a mound of scar tissue in your shoulder you will have a higher risk of reinjury. Scar tissue is just not built to withstand the pressures of regular activity. Surgery may end up adding more tissue to an already narrow space inside the shoulder. Even worse you could end up with frozen shoulder or another impingement. This is why surgery is only performed as a last resort. if surgery can't be avoided, know that frequent use of a Cold Compress or Ice Pack after your surgery will get the swelling down very fast. Much of the pain you feel will be from the swelling, and you will be surprised how quick the pain drops off once the swelling is down. the Shoulder TShellz Wrap is a safe, electromagnetic energy device that will help reduce scar tissue, increase blood flow to the area (and thereby accelerate the body's own healing process). Treating your shoulder with this device is probably the easiest and most effective way to accelerate recovery. Consistent usage of a Cold Compress or Ice Pack is a highly effective conservative treatment option to increase your chances of avoiding surgery as well. when applied before stretching or movement of any kind, the Shoulder TShellz Wrap will help the connective tissue in your shoulder joint elongate, and stay elongated. This means that it helps improve your range of motion and can prevent joint atrophy. It may seem hard to believe, but regardless of what type of shoulder surgery you have undergone (or are trying to prevent), our Shoulder T•Shellz Wrap® home therapy product will assist you in recovering from your injury faster and reduce the chance of degenerative shoulder conditions by maximizing blood flow where it is needed most, and reducing swelling and inflammation induced pain. With these simple and safe home treatment therapies - cold therapy and DTR Therapy therapy, you will notice significantly reduced pain and an incredible improvement in your rotator cuff range of motion. Remember: Do not assume you have an impingement! Only your doctor can give a proper diagnosis and eliminate other causes of shoulder pain - some of which can be very serious! During your recovery, you may have to modify and/or eliminate any activities that cause pain or discomfort in your shoulder until your pain and inflammation settle and you gain more mobility and strength in your shoulder. The more diligent you are with your treatment and rehabilitation, the faster you will see successful results! Click HERE to Go To Our Online Store We take all major credit cards and Paypal. If you are on your mobile phone, Click HERE to Call Our Office (toll free continental NA).